Were you looking for Car Accidents - California or Car Accidents (National) lawsuits? More and more car accidents are the result of distracted driving; drivers who are distracted by their cell phones—texting, checking email, making phone calls and using GPS—while driving. All too often, other people including other drivers, passengers and pedestrians, are harmed as a result of driving while distracted. 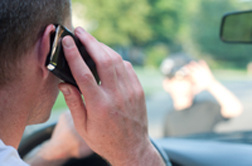 Send your Distracted Driving claim to a lawyer who will review your claim at NO COST or obligation. Distracted driving occurs when the driver of a vehicle takes his or her eyes off the road, hands off the steering wheel and/or mind off the task of driving. Among the activities that can be involved in distracted driving are texting, talking on a cell phone, dialing a phone number, and using GPS or other navigation systems while driving a vehicle. Other activities, such as talking to passengers, eating and watching vehicles may also be considered distracted driving. According to the National Highway Traffic Safety Administration, in 2012, 3,328 people died in car accidents that resulted from distracted driving. In 2011, the number killed was 3,360. Meanwhile, in 2012 the number of people injured in a distracted driving accident was approximately 421,000, up from 387,000 in 2011. The administration estimates that at any given moment during daylight hours, 660,000 are in some way using a cell phone or electronic device. Because texting while driving involves removing both the eyes from the road and the hands from the steering wheel, it is one of the more serious causes of distracted driving and among the most likely to cause an accident. Furthermore, according to the NHTSA, in the time it takes to send or receive a text message a vehicle moving at 55 miles-per-hour will travel the distance of a football field. Laws regarding distracted driving vary by state. Lawsuits have been filed against drivers whose distracted driving caused injury to other people. In cases where the distracted driver was an employee on-duty at the time of the accident, lawsuits have also been filed against the employers alleging employer policies may encourage or condone unsafe driving practices. In addition to distracted driving, driving while tired and driving while under the influence can also cause serious accidents and result in lawsuits against the drivers involved.